Most climate change activists cite the greenhouse gas theory-that man-made gases are causing changes to the Earth’s temperature. 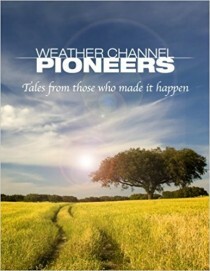 Christy noted that this theory predicts an increase in frequency of record-breaking temperatures. Yet the exact opposite is happening in the U.S. ‘the frequency of those temps is declining’. The cause? Christy says it’s likely “urbanization and natural variability. 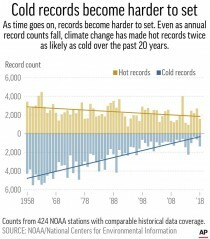 The AP… is spinning the story by only noting that record lows are fewer than highs now - but the real story is that in the U.S., both extremes are falling. This is consistent with the decline in number of days greater than 100 [degrees] Fahrenheit (or 105 Fahrenheit or 95 Fahrenheit, etc.). 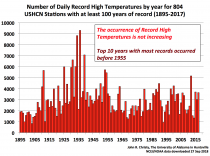 The differential decline in record temps is inconsistent with [greenhouse gas] theory, which predicts an increase in record highs and higher TMax in general. 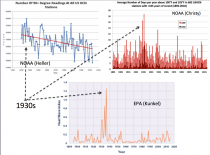 Note: the decline in both heat and cold records was shown even in Borenstein’s post. Without assessing the role of increased urbanization and other land-use changes… changes in atmospheric aerosols overhead, microclimate around observing site, changes in heights of observations, and concurrent trends in surface air humidity, it is not robust to attribute any changes in extreme temperatures to just human-added atmospheric CO2. It’s also important to note that recent temperatures are not at all unusual, with 2018 continuing a several-year cooling trend. The media-hyped “hottest year” claims do not hold up to scrutiny. Princeton physicist Will Happer ridiculed such claims and explained that “alleged record warmings are tenths of a degree or less, comparable to the statistical error”. Many years ago, I was young, well informed, and absolutely convinced I knew enough to make good decisions for the future of the world, and couldn’t understand just how obtuse all the oldies were, how they just didn’t know the stuff I had just learned. Malthusian economics drove most of us, the Club of Rome had reported, and to my subsequent shame, I confess that in 1975 I voted for the Values Party....I wanted a better world, I knew resources were on the verge of running out, the population was out of control, and we were polluting our one and only planet. It was, I thought, time for the change that was so desperately required. The Values party did not get in, to our surprise the resources did not run out, Simon won his bet with catastrophist Erhlich, as countries became more wealthy they cleaned up their environments, particularly water, farmlands, and air. China is now wealthy enough to be doing exactly that right now, following in the footsteps of Japan, Taiwan, and Korea. We certainly never see the famous foaming rivers of industrial Japan anymore. Economists now understand that the ultimate resource, the human imagination, never runs out. So is it likely to be with climate change. I urge you to never abandon your skepticism, for a critical mind is your most important asset. Be able to articulate exactly what evidence has persuaded you to your opinion. Opinions though, are not evidence. Consensus is not evidence. The world has many historic consensuses that have turned out to not be so. So far, I don’t mind sharing with you, I have yet to be persuaded. There are two sides to this debate, but only one is well resourced, so you have to work a bit harder to find the arguments of the skeptical scientists. One of the very great tragedies of the whole issue is that since 1990, it has been very difficult for scientists to garner resources from governments to research natural climate change, but we can be certain that the forces that wreaked great climate changes in the past are still active, and may be a much greater magnitude than those wreaked by CO2. All the CO2 being released today is simply being returned to the atmosphere whence it came, and is now available to the biosphere, which we can see is already flourishing as a result. Global temperatures have increased (about 0.7C degrees in last 100 years) ever since the little ice age, and continue to but at nothing like the rate predicted by climate models. We live from the equator to (nearly) the poles, and hence are particularly adaptable, and will adapt to minor temperature changes and have in the past through climate optima, and little ice ages. Much of the land surface of the earth is too cold for habitation or agriculture, some warming of the northern latitudes of Canada and Russia for example will be welcomed. Here in New Zealand, we produce food for the world, with one of, if not the lowest “carbon footprints” of any country. Should you actually succeed in killing this industry, that production will be conducted elsewhere, at a higher carbon cost...so the improvement as you see it, in New Zealand’s emissions will be more than offset by extra emissions elsewhere...we will be adding to the problem, not mitigating it. It is also very important that each of you understands that for any complex problem, there are a range of decisions, trade-offs, to be considered. Do we understand all the benefits that follow from the use of fossil fuels? How many of these are we prepared to sacrifice? What would a fossil fuel-less world look like for you (hint: I don’t think you would like it very much). Have you read or even heard of the “moral case for fossil fuels”, and do you understand the extent to which they feed and clothe the world, provide us with our tools, and our leisure, empower our devices, and enable our travel at present? House us and clean us? You are not informed if you only read one side of the case. I happen to believe in free markets, the economics of von Mises, Hayek, Friedman, Simon, McCloskey, and many of the moderns but I have also read Marx, and various of the collectivist economists, you must know what all the opinion leaders are saying and why. So do seek out “lukewarmers” like Curry, Lewis, Christy, Soon, Balunias, they will lead you to a raft of others “the counter-consensus” that you, like me, may find rather more convincing than the orthodox climate church. Personally I have learned that what I knew at your age (vastly more than my parents knew, of course) was not always right...now captured in the expression “it’s not what we don’t know, it’s what we know for sure that just ain’t so”. We once believed in leeches, blood-letting, that washing our hands was not important, that continents didn’t drift, that stress causes ulcers, a daily aspirin is good, and that there is always an imminent catastrophe on the horizon that never materializes. Have we included accurately in our models the impacts of short and long term natural oceanic cycles, cosmic rays impact on cloud nucleation, clouds, the sun and sunspots, what, if anything, is there still that we don’t know that we don’t know? Can we get initial conditions right? Always examine closely the logic of the case...we have only one world so all we can do is create computer models of the climate, and wait to see if nature tells us the models are a good approximation of the real world suitable for projecting future climates...and if climate is a 30 year average of all our global “weather” then we probably have to wait at least two preferably more periods of 30 years simply to validate the models so 100 years or so. So far the projections and predictions have been wildly wrong, the polar ice is healthy, the Manhattan freeway is not underwater, sea-level rise is not accelerating, and snow is far from “a thing of the past”. As climate scientist and keeper of one of the satellite records ironically observes “the models all agree the observations are wrong”. And the economics don’t work, as Nobel prize winner Nordhaus teaches the cost of mitigation is an order of magnitude greater than the cost of the problem, so the cure is worse than the disease. Don’t take my word for it, or anyone’s. Read for yourselves, go to source. Do not trust any scientist who calls a peer scientist a “denier”. Understand peer review, and that a peer reviewed paper is more often than not just the opening salvo in a chain of events that may or may not ultimately expose a scientific truth. Be very careful of any theory where the accepted facts (historic temperatures, and the location and number of the thermometers)) change regularly to suit the narrative. And finally, enjoy your day, be yourselves, trust your own judgment, read widely, and look behind the data to the motives of the players. There is a (slim) chance you are right, but even if you are, trust in human ingenuity, that fabulous engine of change, to ensure survival not of the world as we know it, but of an even better world than previous generations enjoyed...we will not revert to sleeping with our food animals on dirt floors with unpainted walls! As humans have done for most of our time on earth. I can’t believe I’m still writing about climate change. I’d have stopped long ago were it not for persistent calls to blow up the U.S. economy in order to save the planet. The cult-like demand for action permeates every part of public life, government, media, academia, even K-12. Rep. Among the draconian policy solutions, Ocasio-Cortez’s Green New Deal would have enormous negative impact on our economy. For the record, climate does vary—think ice ages. And a combination of natural climate variability and measurement problems make the likelihood of singling out a human fingerprint very low. I look here at how climate alarmism is being sold in a distinctly unscientific manner. The term ‘science’ properly refers to the scientific method, which is a system of inference designed to weed out incorrect ideas in favor of those supported by experiment and observation. The crux of the scientific method is rejection of theory rather than proof of it. From Bacon to Hopper and Feynman, it has been well understood that scientific theory must be “falsifiable,” that is, subject to test and rejection. Falsifiability depends on narrow and specific conditions imposed by theory. If the conditions fail, the theory is wrong. On the other hand, we hear a lot these days about consensus, skepticism, and denial. Warmists often cite the “97-percent consensus” that manmade climate change is true and “settled.” This claim stems from a single study of article abstracts dealing with climate. The study suffers from a number of serious method flaws and has been roundly debunked. A more reasonable conclusion from the study is that 3% of the abstracts support manmade warming, not 97%. In reality the science is not at all settled. What else is wrong with climate change alarm? First, how did global warming get to be climate change? At least with warming there is a scientific theory: increase CO2 levels and get two or three degrees of direct and indirect warming. Why the switch to talking about too cold/too hot and other severe weather? Perhaps it’s because satellite and weather balloon data have failed to bear out GW theory for almost 20 years. Well, says NASA, surface weather station data do show warming as expected. But this picture emerges only as a result of serial and unexplained fudging of the data. Plus, NASA is from the government and has made such a mess of land and sea surface data as to make it useless as evidence for anything but data manipulation. Second, there’s an awful lot of argument from authority going on in the alarmist camp. The researchers there call themselves climate scientists and make the ostentatious claim that only they can understand the atmosphere. Did you get what I said about the scientific method? What in that description suggests that only experts can be critics? Not to mention, the most powerful cohort in the warmist universe is the computer modelers. These guys design code that reflects theory, what they think is going on in the air. CO2 is in; solar is out. Then they run the models to get a whole bunch of curves and say, well then; that proves it. The models did just what we told them to do. Anything funny about this logic? The climate wonks have a receptive audience. A couple of generations of smart people who learned about science stuff in school say: if scientists say it’s going to be bad then by golly it will be bad. One of these smart people, presidential candidate Sen. Kamela Harris, declares climate change to be existential and demanding of action, no matter the cost. Existential? A couple of hypothetical degrees Celsius is existential? How do you think your petition to lighten up would fare in her office? How about Sen. Sheldon Whitehouse calling for RICO prosecution of deniers. Or former President Obama implying that climate change deniers don’t believe in the moon or think it is made of green cheese. I’m pretty sure we did away with the green cheese theory a long time ago. It kind of sorts out into curious folks who aren’t much impressed with the historical record of Malthusian doom-casting and smart people who just know that our evil species is bad for the planet. The curious folks think about the evidence and the smart people just don’t understand why curious folks don’t like science. What? If I don’t believe in string theory I don’t like science? But what if it isn’t about science in the first place? The question of greenhouse gas warming has been around a bit more than 100 years, working its way through Fourier, Arrhenius, Callender and Revelle. But the political interest in CO2 is relatively recent. The global warming juggernaut began in the mid ‘70s as a crisis epiphany under the leadership of the late UN diplomat Maurice Strong. Mr. Strong served as the first executive director of the United Nations Environment Program and recognized the potential value of CO2-induced warming theory as a tool to proselytize for globalization. Strong was the driving force behind Agenda 21, a program to enforce sustainable energy development through public education and training. The scientific arm of Agenda 21 is the IPCC (Intergovernmental Panel on Climate Change), which name telegraphs its staff of bureaucrats. IPCC has published Summaries for Policy Makers (SPM) based on existing refereed science papers. One of IPCC’s noteworthy accomplishments has been to assure that its SPMs are unencumbered by underlying technical detail. Translation: the SPMs say whatever the bureaucrats want them to. Wait a minute! You mean to tell us we’ve been pouring tens of billions down a climate change rat hole for a couple of decades and what you really want to do is screw up the economy? We’ve been robbed! Dr. William Lippincott is a retired environment scientist. His inferences are based on extensive literature research on the mechanisms of climate variability, a task open to any student of the scientific method.